This year’s ASHP Midyear Clinical Meeting was held at the Ernest N. Morial Convention Center in New Orleans, Louisiana on December 6 through December 10, 2015. For many, the Midyear Meeting is about the latest in clinical advances, but for me, it’s an opportunity to see all the new pharmacy automation and technology. And the best place to see the latest and greatest technology is in the exhibit hall. Below you will find my thoughts on what I saw while roaming the exhibit hall. By no means is this an exhaustive list, but rather items that I think are worth mentioning and thinking about. The pharmacy clean room (a.k.a. iv room) continues to get a lot of attention, and rightly so. With the introduction of USP Chapter <800> and proposed changes to USP Chapter <797>, the clean room is on everyone’s mind. This year’s exhibit hall was a direct reflection of this. The clean room automation and technology space is It was bound to happen. Over the past few years, several vendors have introduced products designed to help pharmacists with compounding sterile products or meeting clean room regulatory requirements. Aesynt is now part of Omnicell and CareFusion is part of BD. BD has had more time to ramp up their messaging and it was obvious in their exhibit this year. APOTECA was not present in the Midyear Exhibit Hall this year. If you recall, APOTECA is the company responsible for APOTECAchemo, a robot for compounding hazardous drugs. Last year about this time they introduced APOTECAps, a semi-automated iv workflow management system. The company was conspicuously absent. There was a good number of booths offering clean room consulting. More than I’ve seen in past years. Aesynt – previously McKesson Automation, now part of Omnicell – was focused on data analytics in the clean room with two new products: REINVENT and Formulary Tool Kit (FTK). I wrote about REINVENT after the ASHP Summer Meeting in Denver. FTK is a tool designed to help pharmacies extend BUD in the cleanroom. BD and Baxter seem to be running parallel races. Baxter had a press release at the meeting that focused on DoseEdge BD did the same for Cato. Baxter will be pushing their Epic integration in the coming year. Baxter was showing off their DoseEdge scales for the first time ever at a Midyear event. DoseEdge has had gravimetric functionality for quite some time, but the concept has never been popular with their customers. Apparently that has all changed. Based on conversations with insiders, this appears to be a direct result of pressure from BD’s gravimetric-centric approach. MedKeeper showed off a new booth at Midyear with Verification front and center. Verification is MedKeeper’s semi-automated iv workflow management system. Something that caught my eye while I was in the MedKeeper booth was the images captured by Verification. They’re really quite good. I was especially surprised to find that some of the images I was looking at were taken from outside an isolator. That’s right, the device was mounted outside the isolator, thus limiting the hardware in the hood. Talyst had Talyst IV Room on display. Talyst IV Room is part of the company’s mobile inventory management solution and offers users the ability to build IV kits utilizing barcode scanning for verification, as well as the ability to track sterile preparations throughout the compounding process. 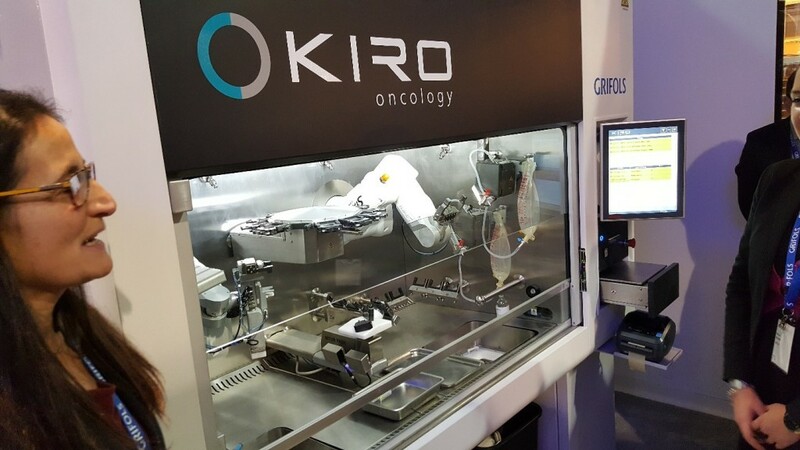 Grifols introduced a new hazardous drug compounding hybrid robot, Kiro Oncology. Kiro is a bit different from previous robots as it uses two robotic arms to compound sterile preparations. It’s an interesting concept. Compounding robots were out in full force: Aesynt with v.STATION, ARxIUM with RIVA, and Grifols with Kiro Oncology. RFID-enabled technology was more prevalent at this year’s ASHP Midyear than I can recall in previous years. Booths that had RFID-enabled products on display were typically busy, and the people in those booths were engaged in conversation. Does this mean that pharmacy has finally turned the corner on RFID? Perhaps, but the technology still has some barriers, both real and perceived to overcome. It is clear to me, however, that RFID has niches in pharmacy and vendors are finding those niches. Three booths that I thought were particularly busy were MEPS Real-Time, Inc., Kit Check and FFF Enterprises. 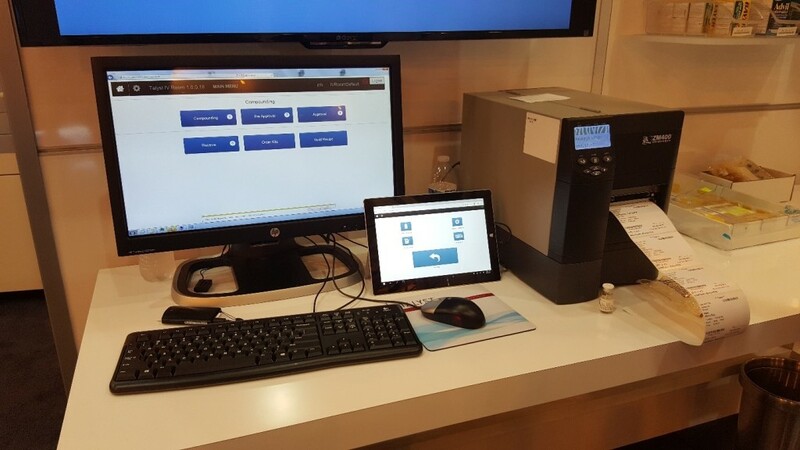 MEPS Real-Time, Inc. was showing off their Intelliguard RFID system, which includes an RFID-enabled medication tray management system, controlled temperature cabinets (CTCs) – both refrigerated and room temperature – and a virtual logbook for tracking medication trays. Kit Check had their “Little Blue Box” scanning station in the booth, which is part of their RFID-enabled medication tray management system. In addition, Kit Check was showing off their RFID-enabled Anesthesia Check system, which I thought was pretty cool. The design is well thought out and offers some nice functionality. FFF Enterprises is a distributor of plasma products, vaccines, biopharmaceuticals, and biosimilars. Part of their product line includes Verified Inventory Program-Consignment (VIPc), which includes RFID-enabled refrigerators that offer automatic track and replenishment for their product line. Cardinal Health does something similar. SencorpWhite was on hand with a small booth providing information on their RFID capable carousels. They didn’t have a physical carousel in the booth as in previous years, but instead opted for literature and a looping video to support their product offering. PharMEDium announced that they will be making pre-filled syringes with RFID tags embedded in the labels. This is big, but the announcement went unnoticed by many. I wouldn’t have known about the move had I not been speaking to one of the vendors mentioned above. I verified this with one of the PharMEDium executives and was informed that the RFID-enabled pre-filled syringes will not be proprietary to any single company, and will be made available to anyone looking for pre-filled syringes with embedded RFID tags. It has been clear for quite some time that refrigeration is going to be important for the next generation of pharmaceuticals, including biologicals. Pharmacies will need to invest in and utilize better security, as well as real-time monitoring for temperature, humidity, and inventory. The exhibit hall was full of vendors offering real-time monitoring. Have a data connection, i.e. “the internet”? If so, then you have everything you need to use many of these systems. Vendors are offering cloud-based storage of information, which means anytime, anywhere access to data. Real-time monitoring and alerts mean that pharmacy directors will have peace of mind that their pricey inventory is in date, properly stored, and in stock. It’s a win-win. All the major pharmaceutical grade refrigerator vendors had a presence in the exhibit hall: Helmer, Follett, Migali Scientific. Not to mention seeing many other vendors with one of these brands in their booth. Partnerships and alliances appear to be the most efficient method of ensuring that you can offer a refrigerated solution to your customers. RFID-enabled refrigerators. See the section on RFID for more detail. The Evolve line of pharmacy-grade refrigerators from Phononic were quite impressive. These refrigerators are powered by SilverCore™ Technology. They have no compressor, meaning they have no mechanical parts, run quiet, use less electricity, and generate less heat. The refrigerators use solid-state heat pump technology coupled with a non-hazardous, non-toxic refrigerant. In addition, the units provide alerts for temperature, door, battery, memory, loss of Wi-Fi, and loss of power. Check the image below showing the solid-state “pump”. Vaccine Smart-Fridge. I wrote about this back in September. The Smart-Fridge is an interesting concept. The system offers single-point access to vaccines, providing real-time alerts on inventory shortages and temperature. Automated temperature monitoring ensures that things stay within their appropriate temperature range, and analytics and historical dispensing data are collected and made available to the user. Strip packagers have been around for a long time. They were popular in acute care for a while, but not so much anymore. However, there appears to be renewed interest in the technology for use in ambulatory care pharmacy, especially as a method of improving medication adherence. I spoke to several strip packaging vendors that are seeing renewed interest in the technology. Most attribute this to the introduction of strip packaging as a medication adherence platform made popular by recent coverage of PillPack. I wrote about PillPack back in February of 2014. DYNALABS DVx™ Onsite Drug Verification System. DVx allows users to quickly and easily verify drug identity and strength (concentration) in real-time. The demo was impressive. The representative that I spoke with said that DYNALABS currently had a limited reference library, but were adding new drugs all the time. ScriptCenter by Asteres. Think of ScriptCenter as something similar to the Amazon Locker model. 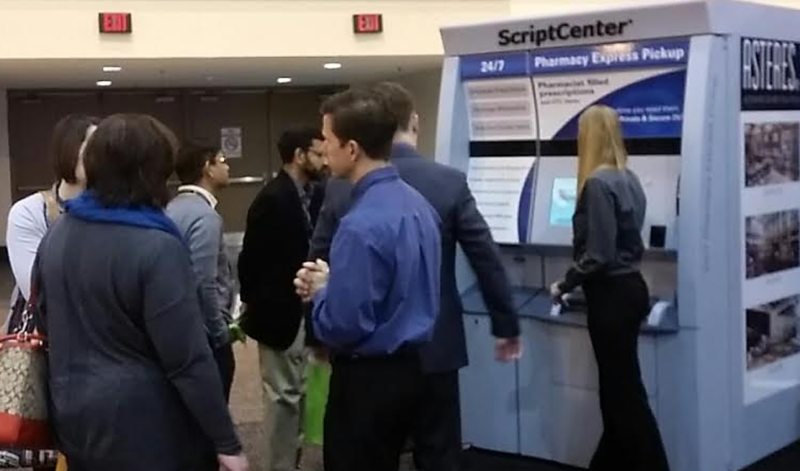 Pharmacies fill medications, place them in the ScriptCenter kiosk, and allow users to pick them up at their convenience. Kind of an ATM-style solution to medication refill pickup. The system sends messages to patients when their prescription is loaded and ready. Users can pay with credit card or payroll deduction. You can even load OTCs into ScriptCenter. I spoke to Dana Darger, Director of Pharmacy at Regional Health in Rapid City, SD about ScriptCenter. He has been using the unit to provide employees with 24/7 access to medication refills. So far he’s been pretty happy with the results. Dana commented that ScriptCenter has helped alleviate congestion in the outpatient pharmacy as well as give hospital employees easy access to their refills. Cactus Smart Sink. I wrote about the Cactus Smart Sink while attending Midyear. The Smart Sink is a pharmaceutical waste disposal container that renders its contents “unrecoverable, non-retrievable and unusable”. It’s small and unassuming. I thought it was pretty slick. Swisslog Nexus Station. One has to wonder how a tube station can be exciting. Well, if you’ve ever worked in a pharmacy where items are queued up due to volume, then you’ll appreciate the Swisslog Nexus Station. The Nexus allows users to load up to five tubes at a time in a Lazy Susan-like configuration. Tubes can be loaded as non-secure or secure and the Nexus will keep track. Much more efficient than a “one-up” tube station. A PDF version of this report may be downloaded here. The following are some additional comments. (1) Aesynt is now part of Omnicell : Technically, this is not correct yet. The business deal is expected to be consummated in early 2016, but right now they are in a quiet period (i.e., employees for each company are not talking about it). I did not hear anything to suggest this acquisition would not take place. While you may have heard that the RFID-enabled pre-filled syringes will not be proprietary to any single company, and will be made available to anyone looking for pre-filled syringes with embedded RFID tags, I heard just the opposite. When the new RFID-tagged PharMEDium syringes are released, the tagged information will be proprietary and only be accessible via the Kit Check cloud server (i.e., Kit Check customers only). (3) In light of the DEA fines relating to diversion at some leading US health-systems (e.g., Mass General Hospital and Dignity Health; see my 12/15/15 ASHP Connect post), I thought the new Omnicell Analytics tool to help identify potential drug diverters within a health system was quite novel. It provided actionable information about specific employees whose controlled substance handling behaviors made them suspect and deserving of additional follow-up. This tool resides on the Omnicell server and is in addition to the legacy Pandora Healthcare Data Analytics software. 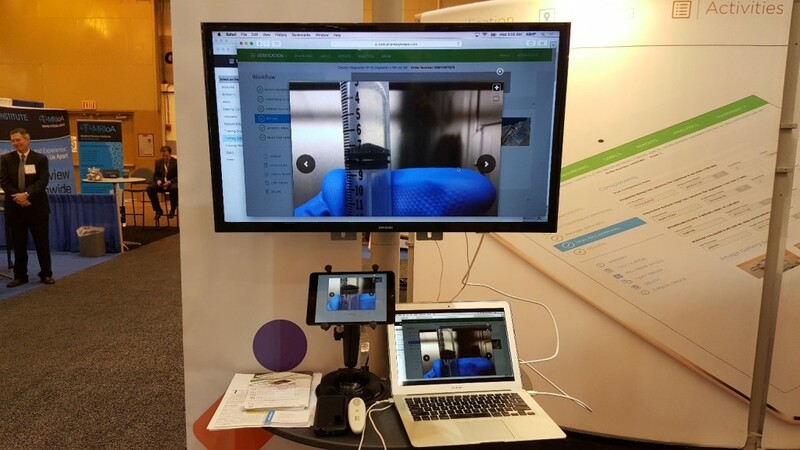 (4) Also in the Omnicell booth, there were some significant enhancements to their Central Pharmacy Inventory Management solution. Now, the carousel-based Central Pharmacy solution resides on the same platform, server, and database (i.e., Common Database) as all of the automated dispensing cabinets and the controlled substances system, and it now includes a barcode-scanning, pick verification module to facilitate pharmacist or tech-check-tech checking of items dispensed from the central pharmacy. 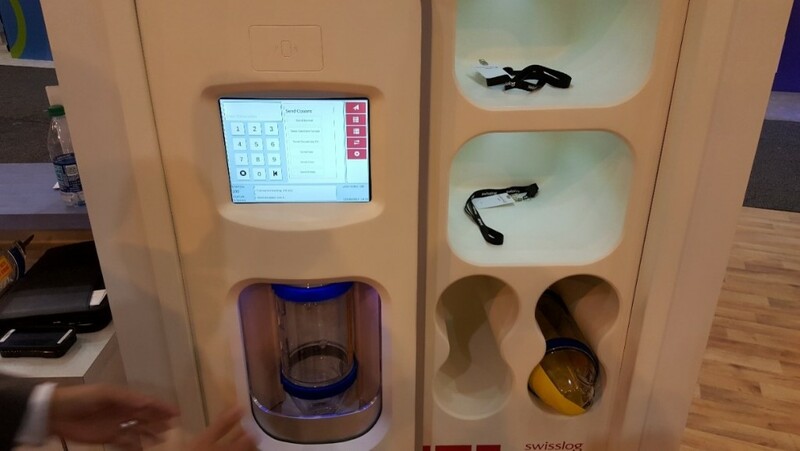 (5) To facilitate medication adherence, there was some new technology in the Cretem packaging booth, that combined the canister dispensing technology of an automated packager with automated blister-card filling technology from Dosis. This new, multi-dose blister-card filling product is being sold in the US by Robotik. 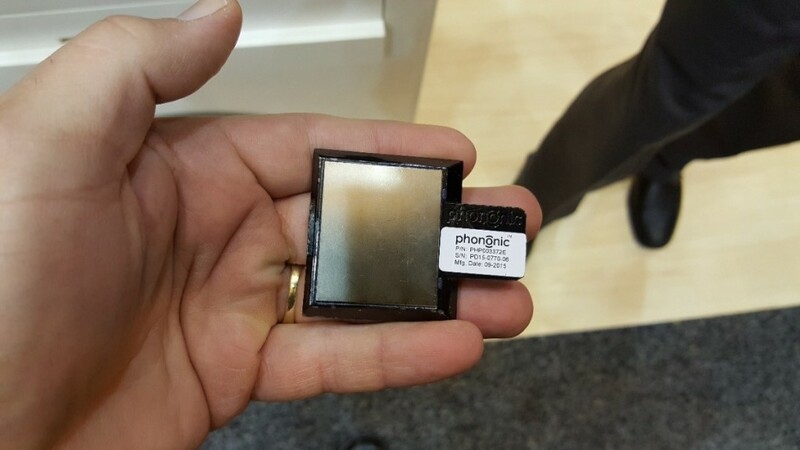 A similar device from the European manufacturer, Global Factories, which includes a vision detection/checking system, is also planned for release in the US in 2016.